The Google Customer Reviews program lets shoppers know that participating shops provide a great shopping experience and excellent customer service—giving them the confidence to make a purchase. Shops that qualify for the Google Customer Reviews program will display the Google Customer Reviews badge on their sites as well as annotated to their Google Shopping results and their Product Listing Ads. A Google Customer Reviews shop will display the badge of the same name on each page of their site. Customers that click on the badge will see an expanded badge with additional details about the Google Trusted Stores program. Google Shopping seller ratings may also appear on the expanded badge, as well as a link to the reviews associated with your store. 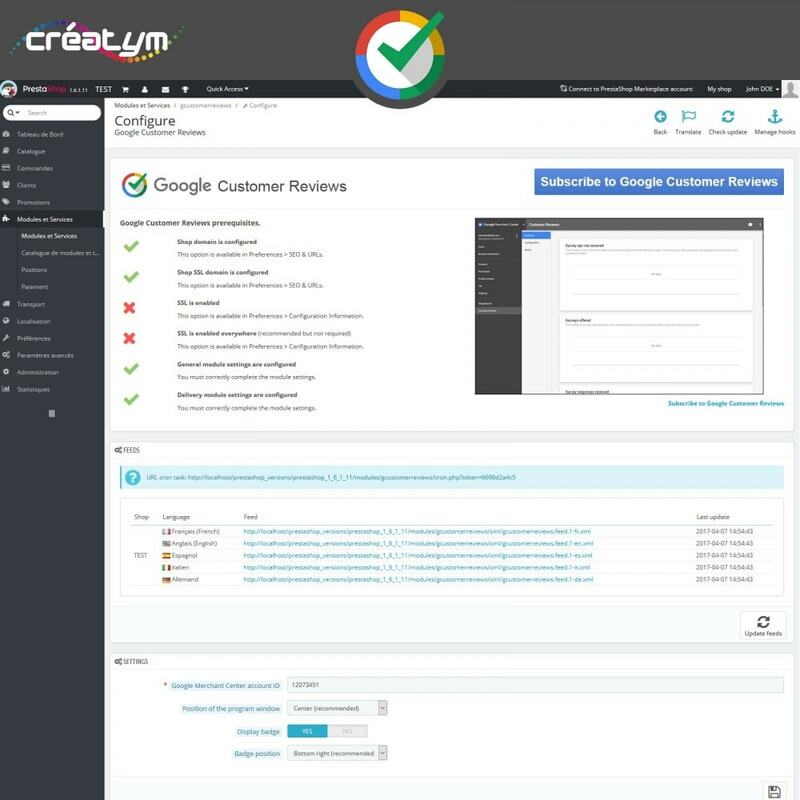 The order confirmation module allows customers to opt-in to the Google Customer Reviews program and also transmits the necessary transaction information to Google. Because this module triggers the purchase protection opt-in and the Google Customer Reviews customer survey opt-in, the order details in this module must be accurate to the best of your ability. 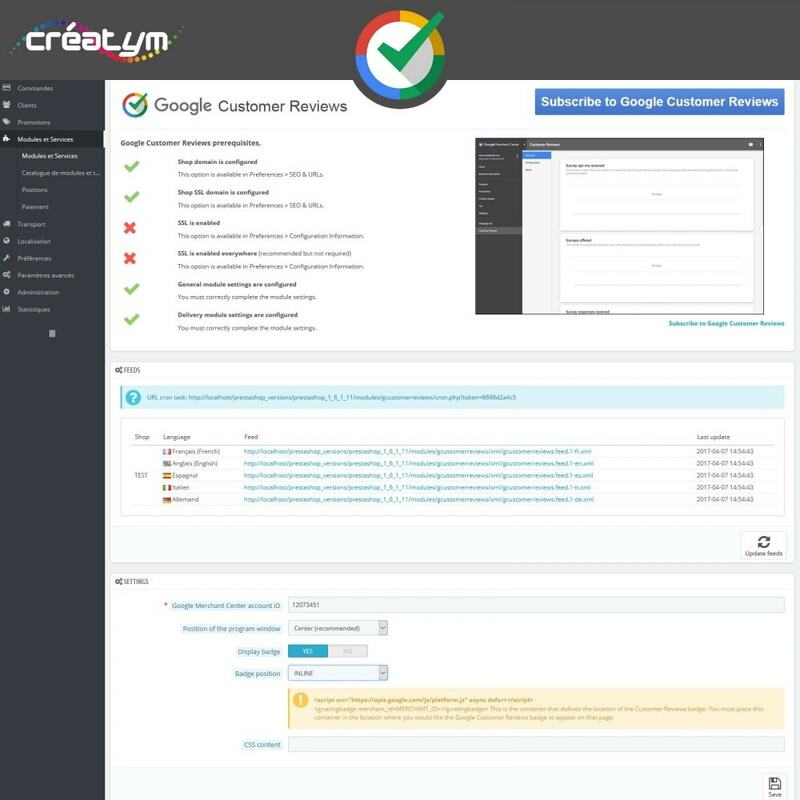 The Google Customer Reviews module includes a free export module for your comments (if you use the Prestashop Product Feedback module) to integrate them directly into the Google Product Notification tool. 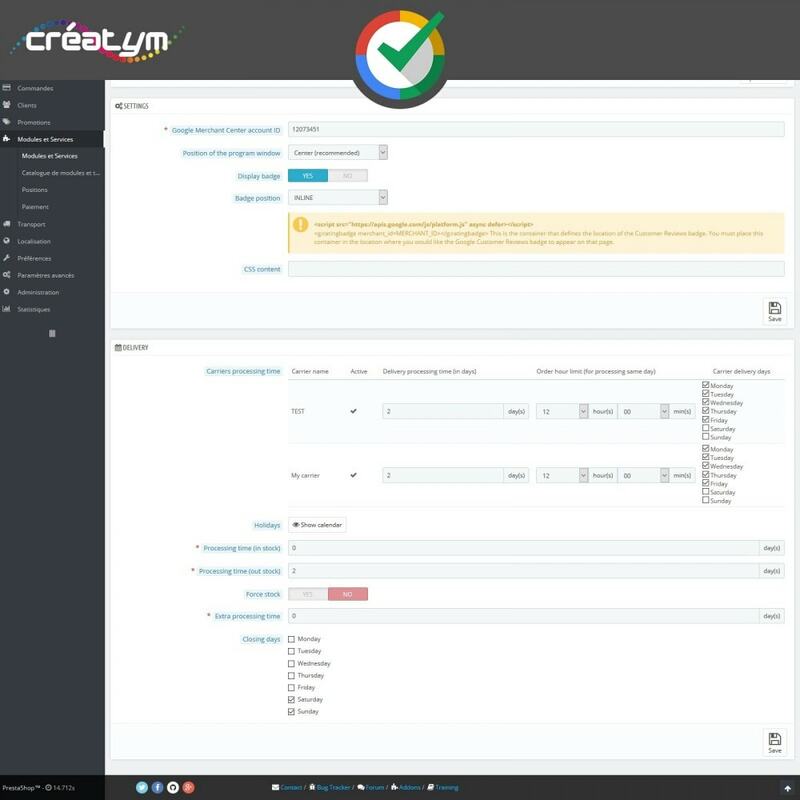 Feeds available for each of your store's languages can be integrated and retrieved automatically by Google. Note: You must apply to participate in the Google Product Reviews program to use this feature. After making a purchase on your site, customers have the opportunity to participate in the Google Customer Reviews program and note their shopping experience at your store. 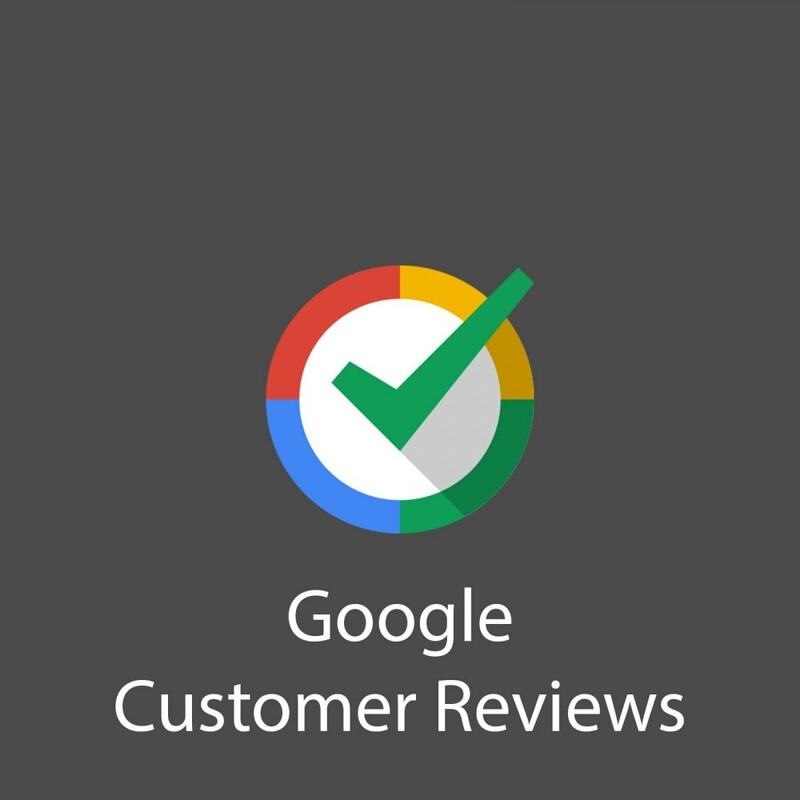 By displaying the Google Customer Reviews badge on your shop, your customers will be able to consult the opinions of other customers and thus reassure themselves in order to proceed more serenely to the passage of command. 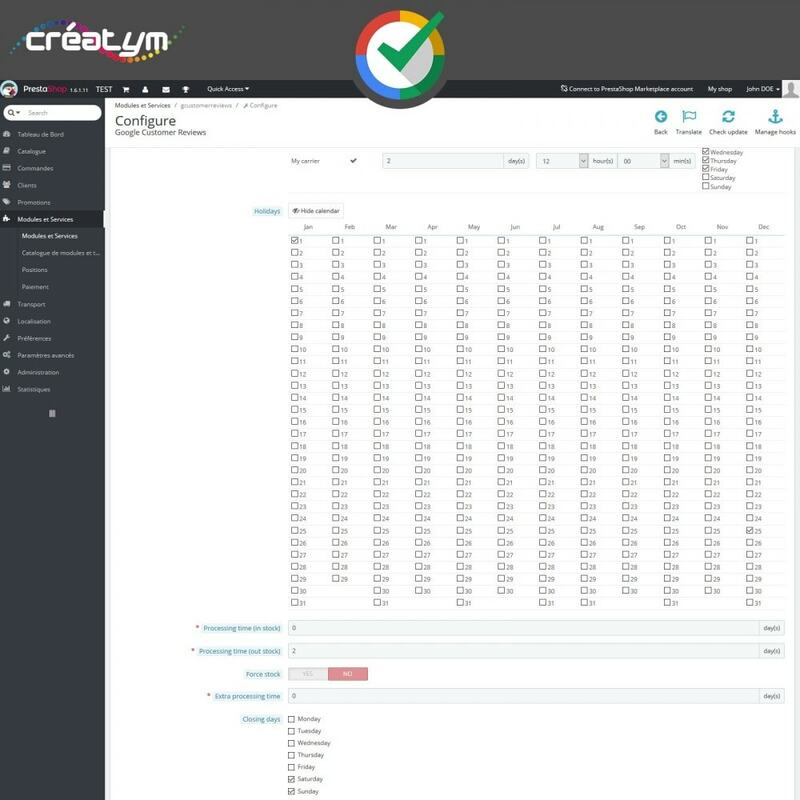 In order to take advantage of all the features of this module, you need to create a Google Merchant Center account if you do not already have one. In order to protect customer confidential data, your order confirmation pages should only be accessible using the HTTPS protocol. It is therefore absolutely necessary to install an SSL certificate on your domain otherwise your integration with the program will be refused. It is advisable that all the pages of the site are secured. AT, AU, BE, CA, CH, DE, ES, FR, GB, IT, JP, NL, US.